Description: Blended from Umbrian Sangiovese, Merlot, and Montepulciano grapes grown in the vineyards of the Castle, this wine is aged 12 months in Oak Slavenian casks, before bottling at the Castle and rested for a further 6 months. 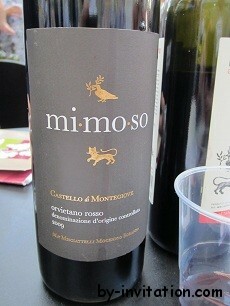 The wine is a deep ruby red colour, the aroma being delicate, understated, and hinting at blackberries. The taste is complex, very oaked and expands in the mouth with a an earthy forest wood taste. The flavor lingers and leaves a dryness; this is not a wine to be drunk on its own and cries out for rich food or a good steak. The name Mi.Mo.So. is a play on the name of the Marquis Misciatelli Mocenigo Soranzo Name. Castello di Montegiove is a 1300 hectare farm and vineyard nestled in the Umbrian hills. Built in 1281, it is at a height of 627m above sea level, which today lets it produce extremely fine wines of distinctive character and quality. Many of the vines grow on the slopes of the Umbrian valley, which has a microclimate giving good ventilation and consistent cool temperatures. Numerous young wines from the Montegiove are able to be kept for years, although good enough to drink right now.